Compared to delicate antiques or family photos, electronic equipment might seem too robust to need special care during storage. While it’s true that computers, gaming consoles and televisions have rugged plastic cases to protect them from everyday wear, heat, cold, humidity and dust can wreak havoc on sensitive electronic components. When it’s time to upgrade to a new model or store spare electronics, keep everything in good working order with careful storage. Before you move or store any electronics, remove any batteries in remotes or accessories. Battery corrosion can wreck electronic components. Check the unit for any removable media such as DVDs, CDs or game cartridges. Over time, older media can deform if left in a machine. Detach all peripherals from your computer when storing it. It may seem like a time-saver to leave accessories connected, but prolonged metal-to-metal contact can cause problems, especially in storage with no climate control. Be sure to back up important data before putting computer equipment in storage. 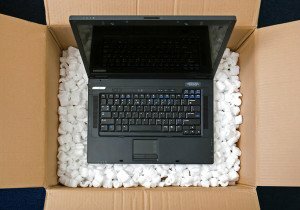 Although your system is unlikely to suffer damage if it’s properly protected in a safe storage facility, all it takes is one drop during transport to turn your computer into a costly paperweight. Electronics experts recommend saving the original packaging for electronic devices whenever possible. Original boxes contain pre-shaped foam pieces and custom inserts to keep items from shifting during shipping, so they’re ideal for packing and storage. For storage in climate-controlled environments, humidity isn’t much of a factor. For storage areas that are susceptible to humidity, add packages of silica gel to any storage container, including original packaging. Silica absorbs excess moisture before it can collect on metal components and cause corrosion. If you no longer have the original boxes for your electronics, use boxes large enough to hold the item with plenty of Styrofoam packing peanuts,bubble wrap or clean newsprint paper on all sides. 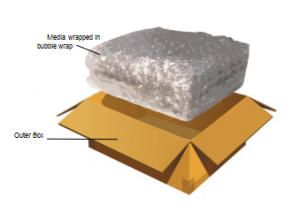 Wrap computer monitors and TVs with a protective layer of bubble wrap and tape paper over fans and vents to prevent particles from finding their way into electronic items’ cases. All the packing material you need can be found at our storage office. Since massive flat-screen televisions don’t fit in standard moving boxes, you can cover these items well with padded moving blankets and store them against a wall to provide support. Never store them flat or stack anything on the screen as pressure can permanently damage some types of screens. Electronic equipment is highly sensitive to temperature extremes and is safest when stored in climate-controlled conditions. Cold causes metal parts to contract, weakening soldered components. Liquid crystal displays, or LCDs, can even freeze during a harsh cold snap. Heat damages electronics in two ways. As metal parts expand in hot weather, they place undue stress on soldered connections. Warm air also holds more moisture, and high humidity is lethal to electronics. Once you’ve figured out a plan to pack and move electronics, a climate controlled storage unit can be just what you need. Contact our office today to find out more about our climate controlled units versus non-climate controlled units.